The author and illustrator race through the expanding Universe, the Solar System, and the history of astronomy, including ancient Babylonian, Chinese, Egyptian and Greek ideas of it. The contributions of Copernicus, Kepler, Galileo, Newton and Einstein are among those discussed. They also cover recent developments, including quasars, pulsars, space travel and Moon landings. Science fiction aspects of all this are mentioned. There are occasional mistakes: for example, the Sun is more than a million times bigger than the Earth (in volume), not a million million times; the day on Venus is long, but not as long as an Earth year. 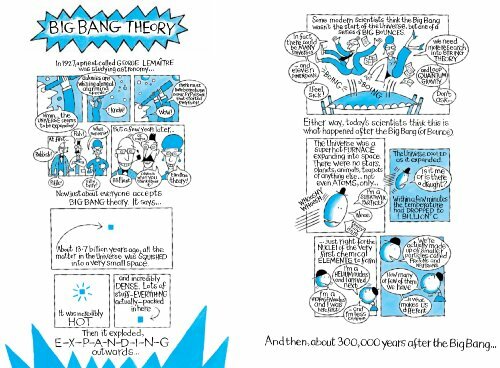 Such details hardly detract from the energy and enthusiasm of this entertaining cartoon introduction to the cosmos.